We are often asked to carry out tennis court repair and maintenance work for existing outdoor facilities which are in need of renovation and a new lease of life. 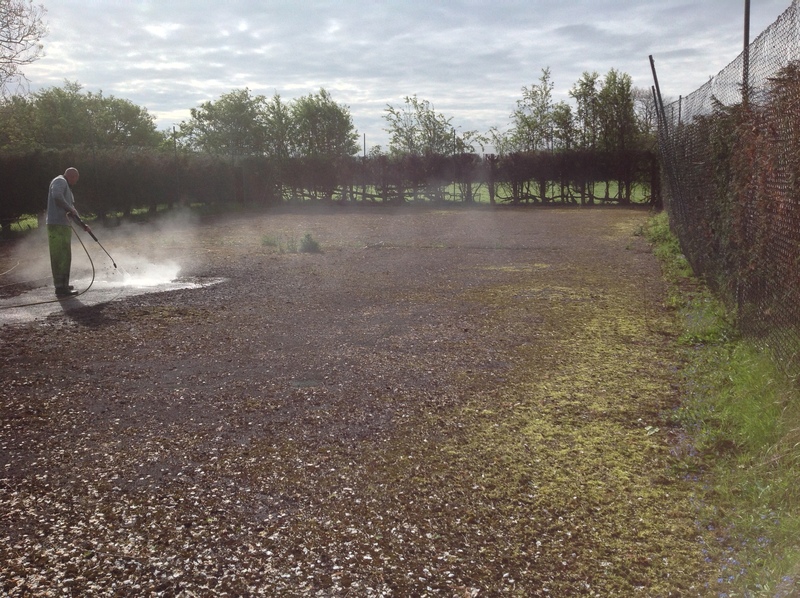 We recently completed a project in Surrey to clean and repaint a single sized court which had become very contaminated and dirty due to a lack of regular care over a long period of time. This client wanted us to carry out a thorough deep clean of the macadam sport surfacing to remove the contaminants which had got stuck to the court. This problem occurs when a surface isn’t kept clean and natural matter, litter and dirt fall onto the court, this then leads to a growth of moss and algae which blocks up the pores in the macadam. When this happens, water can’t drain through the layers and instead sits on top of the flooring and leads to the court becoming flooded and slippery. The picture above shows the process of pressure washing the sports flooring to blast away the moss, algae and debris and lift it up from the macadam to reveal the original surface underneath. 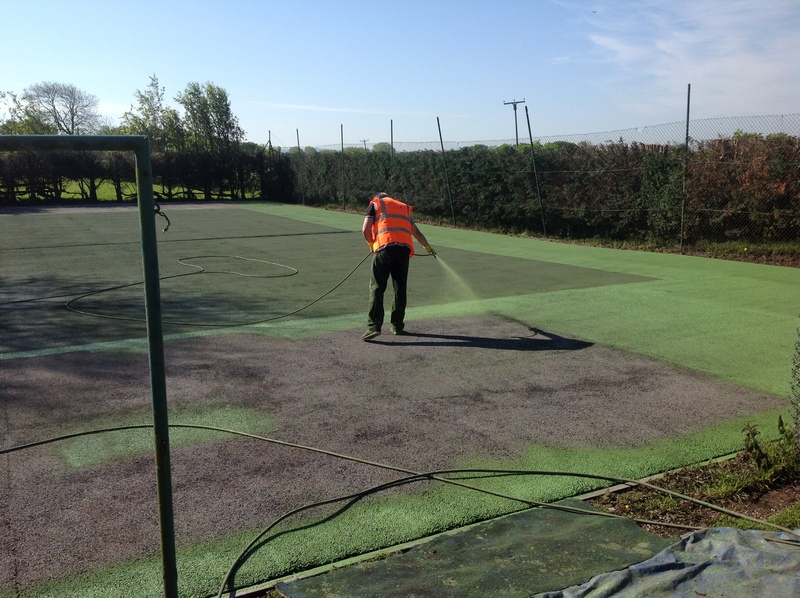 We carry out this process using a mixture of water and a specialist tennis court cleaning solution which binds to the dirt and pulls it away from the surfacing to clean it. This was done throughout the whole area of the court until the clean macadam flooring comes back. Before applying a new paint coating, it’s vital to have a thorough clean and tennis court repair done to ensure a smooth and seamless surface for anti slip paint application. This will ensure that the acrylic paint sticks evenly to the macadam instead of sticking to any dirt or leaves on the surface as these can peel away and leave the court looking patchy. The next part of the tennis court repair and painting was to apply the chosen colour of acrylic paint to the tarmac flooring. This particular client decided to have their court spray painted in a green two tone design which had dark green on the main playing area and light green around the edges to create a runoff. Once the main coloured coatings has been applied and left to cure, we could then put down tennis line markings in white. The paint that we used for this project was a specialist acrylic anti slip sports paint which is combined with a mixture of aluminium oxide and silica sand to achieve the right playing characteristics. We can also apply this paint solution for multi use games area facilities where other sports like netball and basketball are played. Have a look at this video below which shows the full process of cleaning and repairing the existing tennis surface and applying a new fresh paint coating to bring back the original playing qualities and make the facility safe again. When the new paint coating was complete and had been allowed to cure, the final result was a sports court surface with good as new playing qualities which can now be used for recreational use as well as competitive events. 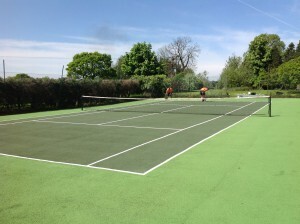 The client is very happy with their tennis court which now looks and plays a lot better and can be used all year round. In order to keep the facility in this good condition, regular proactive maintenance such as brushing, jet washing and chemical treatments will need to be applied on a regular basis. 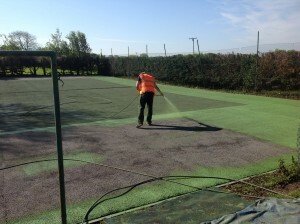 More details on the maintenance which should be done for tennis courts can be found here https://www.sportsandsafetysurfaces.co.uk/sports/tennis/maintenance/ so take a look at this page if you need any advice on looking after your macadam, polymeric or synthetic turf facility. If you have a sports facility which is in need of tennis court repair and painting, we can offer advice and quotes for carrying out this work. With many years of experience in the sports construction industry we have completed various projects at domestic homes, leisure centres and educational organisations to improve the performance qualities of existing facilities as well as building brand new ones. Please use the contact form on this page to get in touch with us and we will come back to you with help in regards to costs and designs for this sort of work.